Home > Shop > Black onyx stone weed blunt smoking holder. Black onyx stone weed blunt smoking holder. New handmade Black color onyx stone weed blunt smoking holder 1.5" . with free shipping US only. free pipe screens. This way you can easily smoke your blunt and feel the comfort of nature comes to you getting together as an one big smoke. 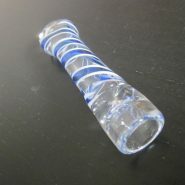 handmade from natural black onyx stone to create full happiness for the average pipe smokers here and around the world.